Wow, can you believe that 2018 is already here?? Not us! Last year really flew by and now it’s time to welcome January. 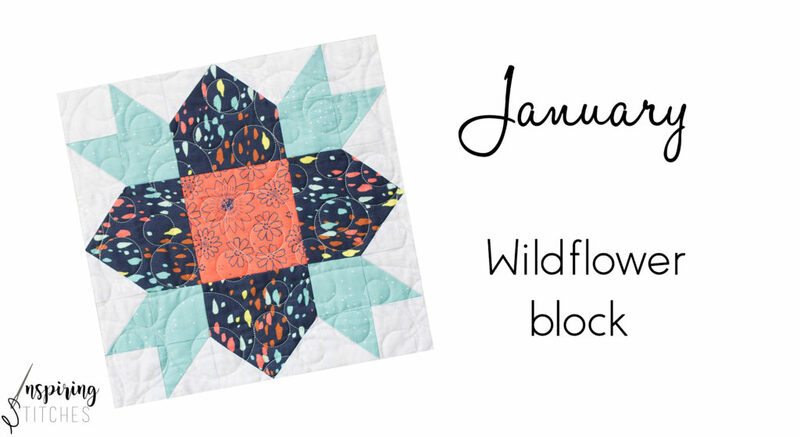 We are kicking off the new year with the first block of Heartland Heritage, the Wildflower. The Wildflower block measures 12″ square when finished and uses 4 different fabrics. Amy and I pulled from our stash of fabric scraps. If you have not grabbed the Heartland Heritage calendar yet, be sure to check our retail partner list to find a shop near you. To get you started, here are two of our finished blocks. Now it’s your turn. We know that each wildflower block will look completely different based on the fabrics you select and can’t wait to see what fabrics you pull. Want even more inspiration? Be sure to check out hashtag #inspiringstitches to see what others are have on their cutting table. Before to take off to make your blocks, be sure to check out Heather’s tips on HST trimming for success, and Amy’s tips to press and match your points with ease. Click the blue button to share your Wildflower block. *Suggested image size is 600 x 600 pixels. Be sure to mark your calendars because each month we will be back to stitch up a fresh new block of Heartland Heritage. I tried 3 times to upload pic of Jan block will not allow me . It is hard to get all 3 of the blocks in one picture that fits to be posted. How do I get pattern? I am loving this calendar and so excited to have a beautiful quilt in the end! Thank you so much for doing this! Please Post a picture of the back of your quilt and a close up of the quilting. Is this the complete post for January? I thought this was a sew along with tutorials? I am a new quilter and would love to see tutorials and more elaboration on your technique, choosing colors and fabrics, etc. Getting the many points to match up on this block was difficult, some tips would be so helpful. I really look forward to completing this quilt with you! thanks! Amy & I both have tips on tricks each month on our sites. From time to time we will be sharing quick videos on different techniques. Two have been shared so far. We look forward to seeing your blocks stitched up. Our posts here on the first of the month are to encourage you to start stitching and share with others and we share tips on our respective blogs, http://www.Amyscreativeside.com & http://www.TheSewingLoft.com on the second Wednesday of each month. There is no formal sign up. We post here on the first of the month and on our respective blogs, http://www.Amyscreativeside.com & http://www.TheSewingLoft.com on the second Wednesday of each month. I just started making Wild Flower. I’m not having any trouble but thought there would be a video or verbal instruction on line for conformation. Amy & I both have tips on tricks each month on our sites. From time to time we will be sharing quick videos on different techniques. Two have been shared so far. Looking forward to seeing your blocks stitched up. As a beginner this is a pretty challenging block, but it is beautiful. I am up for the challenge. Oh Elizabeth, we know you can do it! Be sure to check out our tips and tricks to help you every step of the way. You mentioned that you were going to share a Baby size quilt requirement with use. Maybe I should say “I believe you did.” Have you done this and I just can’t find it? it appears this post did not go through oops. Is there a smaller size available? Amy & I are hosting an additional sew along on our respective blogs, http://www.AmysCreativeSide.com & http://www.TheSewingLoft.com, that requires one block from each month. Towards the end of the year we will share the smaller size layout for those interested to stitch up. Thanks so much for your note. 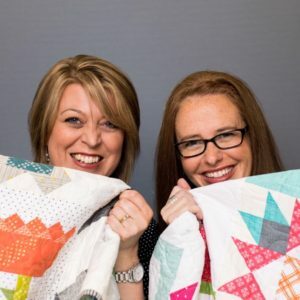 Amy & I are sharing a bonus layout with the sew along we are hosting on our blogs. You will need to make one additional block for each month. Towards the end of the year we will release the final layout. So until then, keep your eyes peeled!